Karate has been practiced in Canada since at least mid-century. The early practitioners of karate eventually established an organization to continue the legitimate development of karate teaching. This organization became the National Karate Association of Canada, since referred to as Karate Canada. A number of instructors in Alberta also formed a governing association to help the development of traditional karate in this province. This was the start of the Karate Alberta Association (KAA). 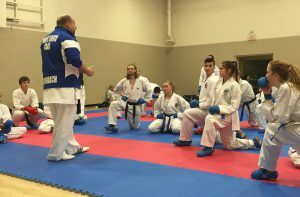 Today, Karate Alberta represents over 2,000 athletes and 50 member clubs within the Province of Alberta. The Association is the only government recognized association for Karate in Alberta. The Association provides the membership with a host of exclusive programs and services including; access to Karate specific National Coaching Certified Program (NCCP) courses and certification, membership in the World Karate Federation (WKF), access to traditional Karate tournaments under WKF rules, access to world class coaches and officials, opportunities to become nationally and internationally certified and access to a comprehensive club insurance program. To provide leadership and an environment that foster success across all levels of the Alberta Karate Community. This will be achieved through the development of strong partnerships and structured to fit within our core principles and values. To promote cooperation and collaboration among all Karate styles through training and competition. Provide the tools and environment to facilitate success. Conduct business ethically and honestly. Operate in an open and transparent manner. Provide proactive and relevant communication. Bring a team approach to all activities.